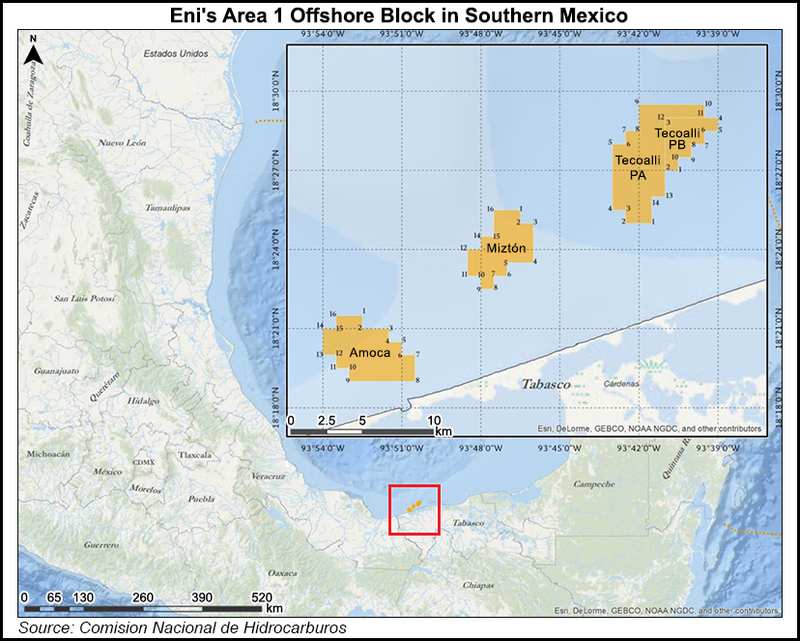 Eni announces that Mexico’s National Hydrocarbon Commission (Comisión Nacional de Hidrocarburos, CNH) has approved the Development Plan (PoD) for the oil discoveries of Amoca, Miztón and Tecoalli, located in Area 1 (Eni 100%), in the shallow waters of the Campeche Bay. This achievement occurs just 32 months after Eni signed the Area 1 Production Sharing Contract (PSC), won in an international bid round, and seventeen months after the drilling of the first well. Area 1 is estimated to hold 2.1 billion of oil equivalent in place (90% oil) in world-class reservoirs. The development will be phased, initially with an early production phase with startup planned in 1H 2019, through a Well Head Platform located on the Miztón field. Production will be sent onshore through a 10” multiphase line and then treated at an existing Pemex facility. Early production plateau will be 8,000 barrels of oil per day (bopd). Full field production will start in late 2020 utilising a FPSO with a treatment capacity of 90,000 bopd. Two additional platforms will be installed on the Amoca field and one on the Tecoalli field. Area 1 production plateau will be 90,000 bopd from 2021. Total development capex are estimated at EUR 1.6 billion. Eni expects to take the Final Investment Decision (FID) in 4Q 2018, although some initial investments to fund long lead items and to start the construction of the first platform for the early production have already been authorised. Eni is present in Mexico since 2006 and established its wholly-owned subsidiary Eni Mexico in 2015. 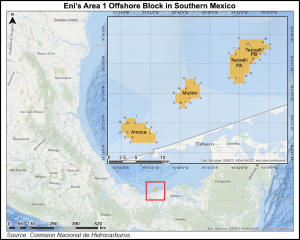 Currently Eni holds rights in six exploration and production blocks in the Sureste Basin, all as the Operator: Area 1 (Eni 100%), Area 7 (Eni 45%), Area 10 (Eni 100%), Area 14 (Eni 60%), Area 24 (Eni 65%) and Area 28 (Eni 75%). Eni plans to drill two exploration wells in 2019 in the new blocks recently awarded.